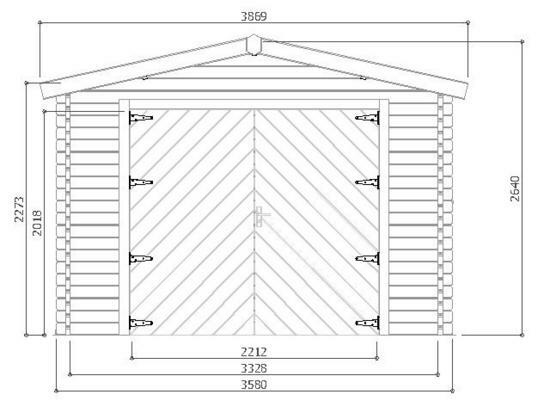 The Solid Log Cabin Garage is made in only 1 size - 18x12, with interlocking log walls made from 40mm Nordic white pine. It is supplied with a single side entrance door, single window, and shutters. This building is not supplied with a floor and requires a substantial concrete or paving slab base which is a flat and level to avoid problems during installation. These buildings are manufactured using 40mm tight-grained Nordic White Pine log boards with an interlocking corner construction. Most buildings in the Solid Log Cabin range are supplied UNTREATED and require a preservative treatment immediately after installation. The sizes quoted above are external wall-to-wall dimensions, including the corner projections.